To prepare for the demonstration students are assigned homework problems dealing with brittle deformation in which they must plot Mohr diagrams and determine shear plane orientations and Coulomb coefficients. In class we examine an undeformed core of Yazoo clay (Eocene) taken from a test site on campus. The core is then uniaxially compressed using a hydraulic press. The students are then asked to observe and describe the development of shear fractures (including conjugate shear surfaces) and measure their orientations. In addition, they are asked to speculate on the development of extension fractures that develop during unloading. The fracture data are then used to estimate the Coulomb coefficient for the Yazoo clay sample and comparisons are made to values obtained from samples of differing lithologies. 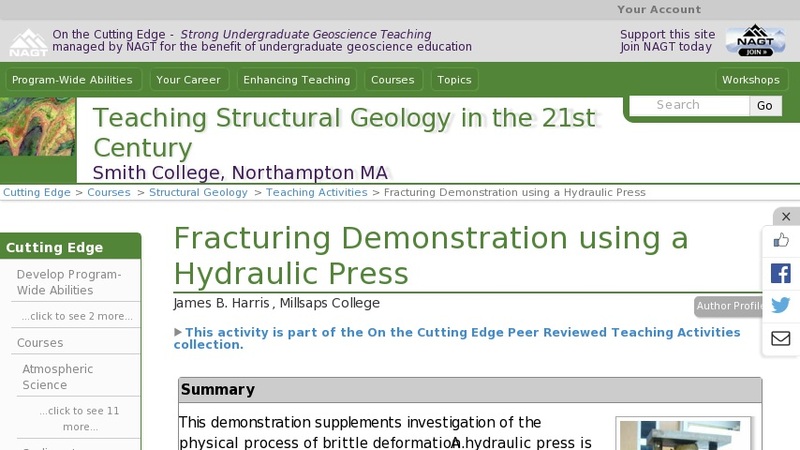 We wrap up with a class discussion summarizing observations from the fracture demonstration.